Welcome to the One Hundred and Thirty Ninth Edition of the Owen Guns Bulletin. Owen Guns, now in its 43rd year in the firearm business, for the best information just use the search boxes within the Large headings below. We have been informed by many of our customers that Owen Guns is the best kept secret in the Australian Firearm Industry. The best service with the lowest prices. 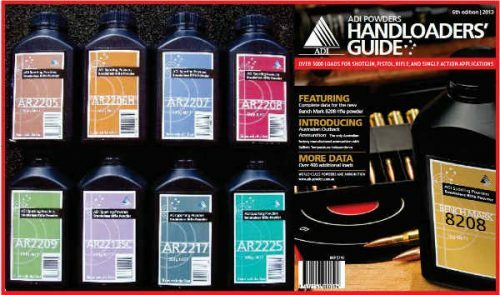 We save money by not having to take huge magazine advertisements, so we have the lowest prices for the best quality firearms in Australia. If you wish to shop around please give us a call, before you buy phone for a price. Phone 07 54 825070, or 07 54 824099. We always have the prices until we run out of present stock. By then we will have more great prices on more stock of other products. New Facebook site for the OWEN GUNS TRUST MUSEUM. Please visit and give a like. Lots of Great Gun Photos. 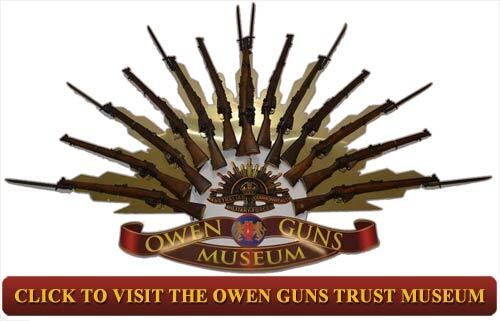 The Owen Guns Trust Museum web page. 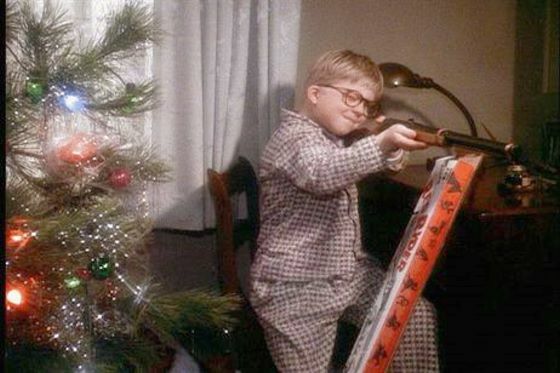 The Staff of Owen Guns would like to wish all our customers a very Merry Christmas and a Prosperous, Happy New Year. If you are travelling, keep safe and call in. We will only be closed on the main days such as Christmas Day, Boxing Day and New Years Day . 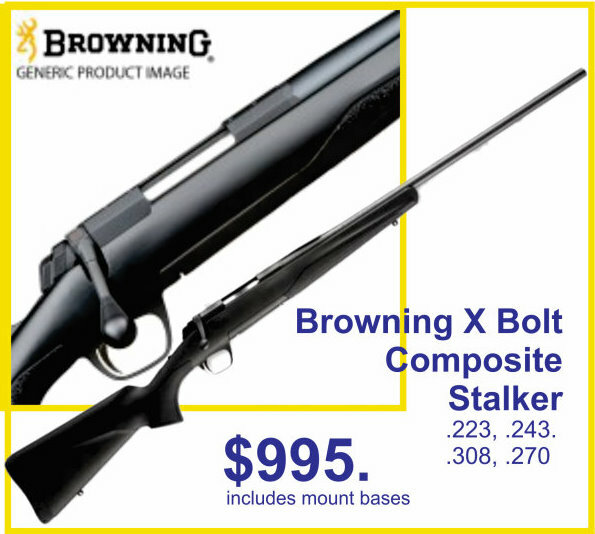 X Bolt Browning Composite Stalker $995. Browning A-Bolt3 Composite Stalker 243 Win, 6.5 Creedmoor, 300 Win Mag, 270 Win $799. Evaluation, Hope For The Future. 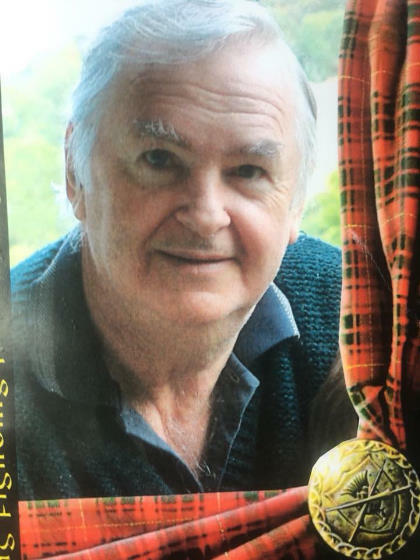 Besides hearing the sad news of the death and attending the funeral service of Ray Smyth, a great warrior for individual Freedoms and Your Rights, I and many of you have been following the results from the 2017 Queensland election. Where to go from here? What worked? What Failed? What Cost too Much? Unfortunately, it appears that Labor will make the 47 seats and be able to rule over us without protection from the minor parties and independents. They will have a thin majority, if we have an active opposition the Labor party will be given no peace, no easy ride. If they do not have the numbers in the house, the opposition will be winning motions. Much like the situation with the last Queensland parliament. Do NOT mourn for the LNP. Take heart we made a large impression on the LNP, we changed the course of an election. Labor will know it too, but they will never admit that it was us. We have to keep the pressure up, be eternally vigilant, and better prepared for the next election. Prior to the NFA betrayal the LNP had made many promises to all the shooting Associations of Queensland they were ‘definitely going to vote against the NFA’, they ‘were going to review the Weapons Act 1990′ and ‘remove all the impositions that were not ‘Evidence Based”. (that would remove all of it as none of its provisions for registration or licences can be proved to achieve any better safety for Queenslanders). Six weeks before the election they bought out a new policy statement, acknowledging the above and adding to it. Idiots to believe them, I know, but even I could not believe that they could throw that all away within a few hours and sit down in the house and vote with Labor to impose the NFA upon us. 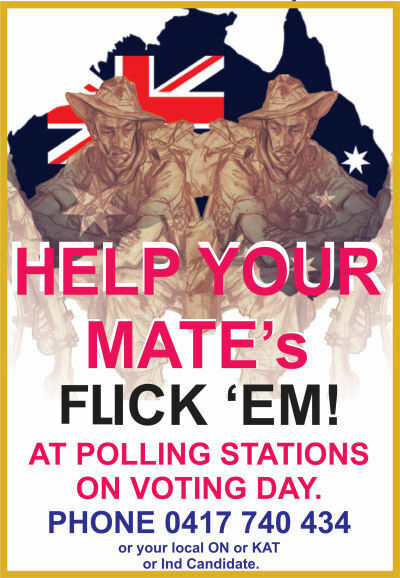 The “Flick Em” campaign had been already designed and paid for, to have the last line saying, “Put Labor Last”. This campaign was originally designed to support the LNP and they thought they had victory in their grasp, they were already allocating jobs for one another. Then the LNP voted with Labor to support the NFA, for a underhanded deal that Labor would swap preferences with LNP to keep One Nation out of government. This betrayal caused the last line of the ‘FLICK EM’ campaign to be changed to, “Put the Major Parties Last”. Both Labor and LNP lost votes, Labor lost a seat to a Firearm Dealer and LNP lost lots of seats. The shared campaign to put the major parties last, split the LNP votes but left too many Labor voters un-affected. Publicly, the media will blame Turnbull for the LNP defeat, but both major parties are well aware of our cause and effect. Firearm Owners, LAFO, Shooters Union and SIVA took a certain victory away from the LNP. There should be no regrets as LNP vote with Labor, they share preferences with Labor so are effectively Labor with another name. If we had done nothing and let LNP win (obviously as they have no back bone) they would still walk all over us, whenever it suited them, following their betraying modus operendi in the same fashion as the Nationals and Liberal governments of 1996 and 2003 gun law impositions. Nationals and Liberals introduced John Howard’s gun laws in 1996 and 2003 and voted with Labor to implement them in every Australian State. 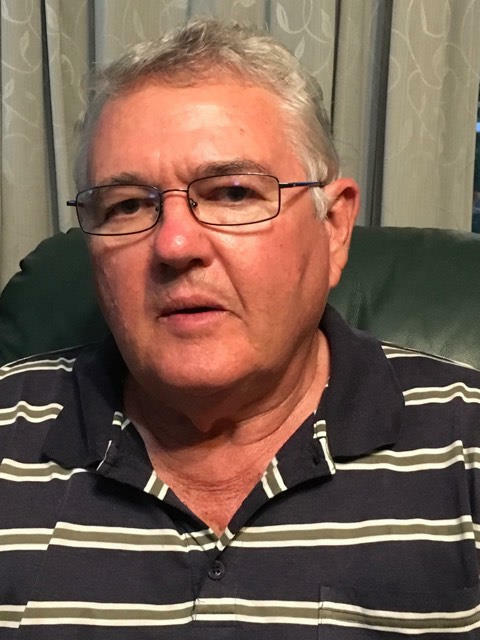 Russell Cooper and Rob Borbridge the National Party government pushed John Howard’s gun laws through the Queensland Parliament in 1996, the reaction was that the largest membership party in Australia, the Queensland National Party was gutted and died. They had to amalgamate with the Queensland Liberal Party. Now in 2017, its ‘déjà vu’ due to the LNP betrayal of shooters. It looks like the LNP has died and might morph again into something even smaller. This is an article contributed by Ian Mc Niven Vice President of the Firearm Owners Association of Australia. Knowing, that the “Flick Em” campaign was originally created and designed to ‘put Labor Last’, raises some questions as to the thought process behind spending all that money and effort to take votes from Labor which is a cohesive union of public servants and unionist. 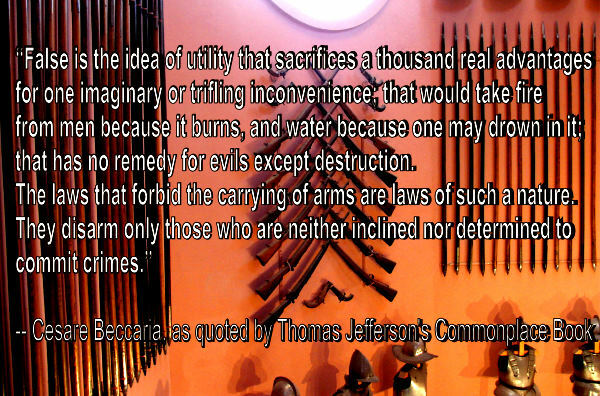 We knew that very few Labor, hippies, yuppies, public service socialist, intellectual ignoramuses, teachers, and academic ‘know nothings’ would even contemplate the ‘Flick Em’ campaign so we have to question the value of the original target for that idea and look for other better alternatives. As Labor voters are totally dependent on social welfare, government grants, government fixed wages and believe that their ends justifies any means to plunder the public purse. So they are hardly going to “Flick Em”. Maybe A New Pensioners Shooters Party? Maybe, our shooting pensioners could be lured to another new political party that supported Self Defence with Firearms, Recreational Shooting facilities available on weekdays, and proper pensions that repay the input taxation they have contributed to for over 50 years. Better health care from the medicare that they have been paying into for 50 years. Due to the merciless, obstructive, non communicative, red taped paper trail it only needs a slight hick up and centre-link stops payments, they cannot afford to pay the rent and another pensioner is made homeless. The major political parties always train their public service henchmen to hit the most vulnerable the hardest, pensioners and shooters. We had only one small “Flick Em” poster to put near the doorway in the shop. I did not see one of the adverts on the TV myself, nor anything in the newspapers and I only heard one radio advertisement whilst I was in the dentist chair. I read what I want, mainly books and dislike TV and radio being imposed on me against my will. Of course, across the counter in the shop the customers favourable comments about the TV “Flick Em” campaign were encouraging. Even on the Friday night prior to the election, I had facebook messages asking me who to vote for, though I had been sharing the messages every night for months. I had printed different choices ‘Shooters How To Vote’ with the LNP, LABOR and GREENS last, but firearm owners were still asking me who to vote for whilst I myself was queuing to vote. Sign To Encourage Helpers on Election Day. I’m just mentioning that as even with all that mainstream media, it still did not penetrate 100% to the main target audience. We have to think of ways of doing better, and doing it cheaper. However the combined efforts of Firearm Owners Association, LAFO, Shooters Union and the ‘Flick Em’ campaign succeeded in ripping the LNP asunder in its traditional heartland. It split the LNP vote. Independents, KAP and One Nation took the benefit from the campaign and acknowledged it. 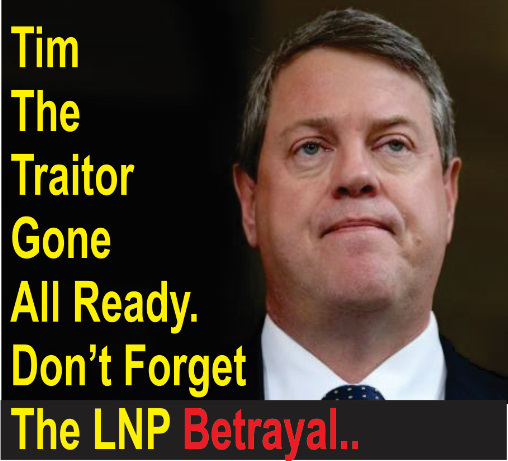 Tim Nichols the LNP Queensland leader has resigned. The affect of the LNP loss is reverberating on to the Federal scene with the National Party of NSW asking Malcolm Turnbull to resign from his Prime Minister position, the Coalition itself is in danger of splitting. The thought of MP’s actually representing their electorates instead of the major parties, has sent a shock wave through all the major party structure and the mainstream media. They are horrified and constantly reiterate words like “the doom of disunity”, “the self-indulgence of some MP’s that cross the floor”, “the gumption to defect from the party that got him elected”. They forget that it was the people that elected them not the party and it should be the people that they represent, not the party. 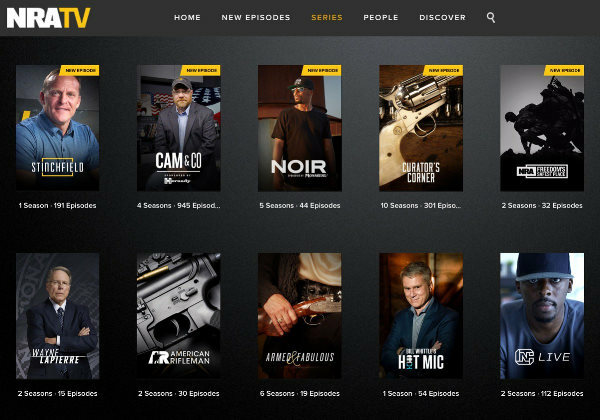 Maybe one of our Non Profit shooting associations, (ideally not involved in buying and selling shooting goods) could take advertisements and articles from all the firearms trade and create something like that NRA internet channel. This would have to be a real winner as it would have a target audience of at least 2 million Australian shooters. This could be the hub, of a spiderweb for all the Australian firearm communications. This vehicle could supply all information from latest rules and regulations, You tube videos, articles on shooting, that could be shared on facebook helping to normalise hunting and competitive shooting. It could show entire movies that have hunting and shooting themes. The internet place to go for all shooters. If we have our own shooting industry producing videos this will save a lot of expense when election campaigns occur. We could communicate to our fellow shooters with news bulletins at 6pm every night. We would be able to better communicate with our own people and show the best aspects of our firearm industry to the Australian general public. Even though we did not get 100% of shooters this last time, next time every firearm owner could have Shooting TV, internet, mobile phone, text and social media on their fingertips. Maybe We Can Help These New Parties? Some of us have had 30 years of experience in fighting election campaigns, against the major parties. We should offer to assist these new hopefuls that are putting their time, energy and money to effect a change for the better. Just check out their policies and get ready to remind them of that little word that means so much, Integrity. To win a seat against a sitting member, we need two Candidates, we need two teams of supporters with a slightly different pitch. They can then swap 2nd preferences. They can take the argument of the slight differences into letter writing campaigns in the local papers. This blocks other letters written by LNP and Labor supporters from getting their letters to the editor. Your two groups can also get the corflutes into the best intersections again blocking out the opposition. We have to break up the ‘Two Horse Race” syndrome in peoples minds, for too long they have been trained only to think about either Red or Blue. We have to convince them, that has never worked so why keep making the same mistake. Two candidates also splits the first preference vote up so that none of the majors get a 51 % so it has to go to preferences and if this is done correctly the 2nd preferences will follow one another 100% and the seat will be won by one of your candidates. Our two candidates should visit the rifle and shotgun ranges, be invited to shooting diners and prize giving award nights. Mail outs to be issued to every house in the electorate explaining the issues, even if you have to deliver them yourselves. True issues can be used, such as Brisbane takes everything and gives the rural areas nothing but the crumbs, yet all the wealth, mining, agriculture industry and hard work is done in the country areas. Internet and Facebook have not been used to network on personal levels. 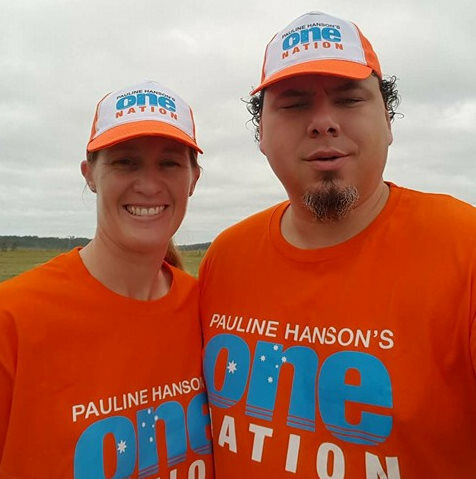 The One Nation campaign was run from Brisbane, when you only have a four week campaign you cannot wait for a week to post something one way and another week to get it back. Candidates, have to respond immediately to local needs and events with their own tools, even if they have to make videos on their mobile phone. Firearm Owners are the largest lobby group in this country. We have to learn how to form action lobby groups in each electorate, organise letter writing campaigns to newspapers and politicians, and how to split the Labor Party vote. We also have to keep reminding our fellow firearm owners the importance of using their votes to push for a better deal for their brothers in arms. We have to teach them to enjoy the battles not the ‘Victory’ as Victory is not the end, or the beginning just a step closer to the end of the war. The what would we do? All Shooting Associations in Australia should have an annual conference, a forum for a weekend in a rural area. Rural because venues, car parking, hotel caravan parks are all cheaper. It does not have to be the size of the Shot Show, just a large hall with seating, a microphone and a projector. Invite every association and pro shooting political party and give each Association 20 minutes to speak on future ideas and tactics and then 10 minutes to answer questions. Long tea breaks for networking and a catered meal on Friday and Saturday night. The mental sparks should fly free and hopefully all groups, or enough of them will all start beating the same drum in time, with the same messages. Maybe, someone could give a talk on Letter Writing Campaigns, Facebook Campaigns, making video’s, organising a rally, and building a profile. Start Friday afternoon and finish 12 midday Sunday so people can get home. Begin to believe that there is light at the end of this dark tunnel. 2 million licenced shooters today, so recruit and encourage more friends to shooting and soon we will have 4 million licensed shooters. We are growing at an explosive rate, and we have contacted more firearm owners and had a huge response from their actions at the ballot box. Labor and the LNP are fully aware that we changed the course of an election, but they will never say it, we have to keep it up and be eternally vigilant, ready for the next time. 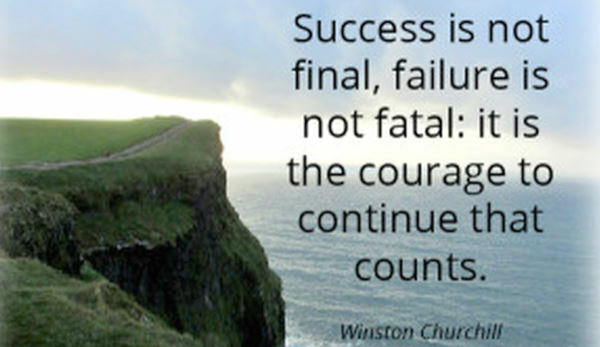 We have to keep the major parties fearful of losing seats, then changes to our plight will finally occur. When a State of Federal by-election occurs we can focus all associations and all of our efforts in to one election and take a parliamentary seat off the Labor Party. Elections will occur soon enough. There is no Spring without Winter, without Mistakes there is no Learning. There is no Life without Death, without Doubts there is no Faith. 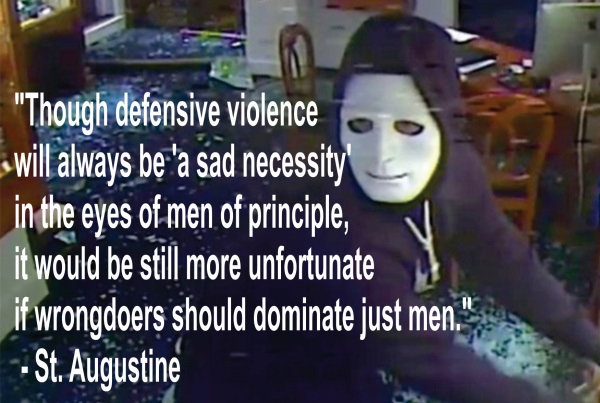 There is no Peace without War, without Fear there is no Courage. For without Mistakes, Doubts and Fears there are no pathways to Wisdom. 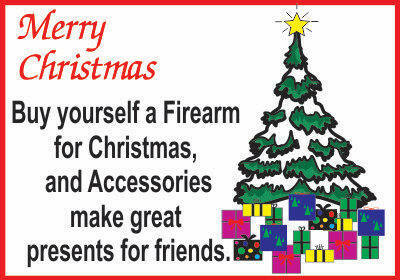 Gun Books Make Great Presents, Are Easy To Post and with years of use and enjoyment. 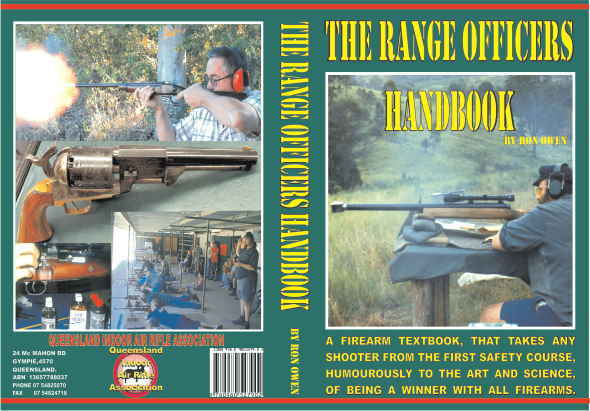 Our Best Selling Book is Australian written and produced with the Australian Shooting conditions in mind “The Range Officer Handbook” pay by Pay Pal see Bulletin Special Announcement Page CLICK HERE As already purchased by members of all Shooting Organisations. Some have even bought two copies one for home and one to take to the club. See Book Reviews by Nick Harvey in Sporting Shooters and Guns Australia in our new Gun Book Category. 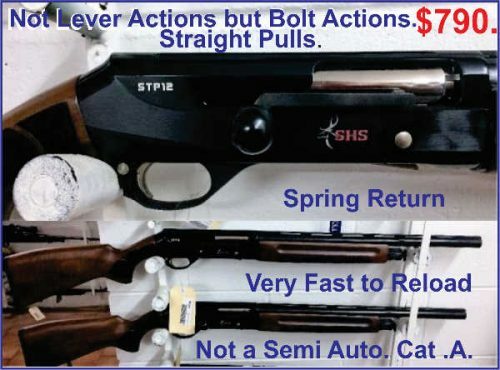 SHS Bolt Action 12 Gauge Shotgun, straight pull, spring return, Not Semi Auto, Category A. Synthetic Stock and Walnut, 10 left. Selling faster than lever action. Chrome 20 inch Barrel. With three interchangeable choke tubes. Browning A Bolt3 308 Win, 270 Win, 30-06sprg, 6.5 Creedmoor Hunter $835 including scope bases. Browning X Bolt Composite Stalker Right Hand 223 Rem $995. including scope bases. Howa Mini 222 Varmint Heavy Barrel with 10 Shot Detachable Magazine $575. 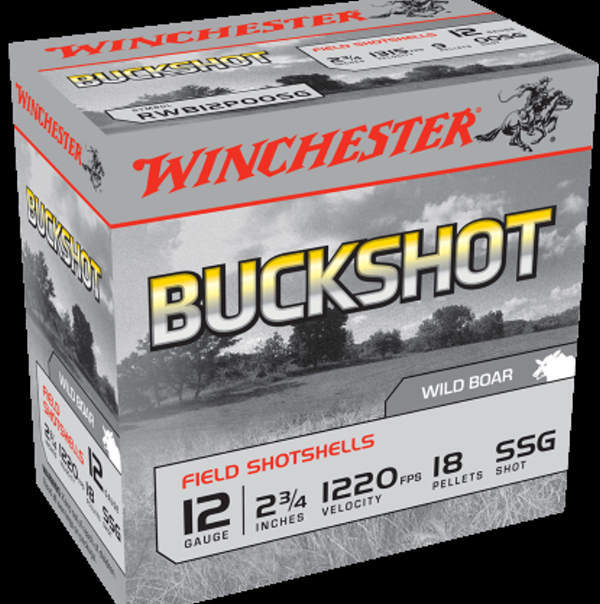 BUCKSHOT SSG 12 gauge 122o ft per second Case of 250. $180. Great medicine for Feral Pigs. 10 pkts of 25. 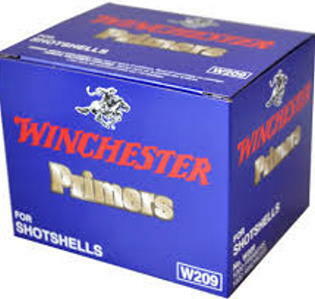 Winchester .243 Win 80 Grain Soft Point Boat tails. 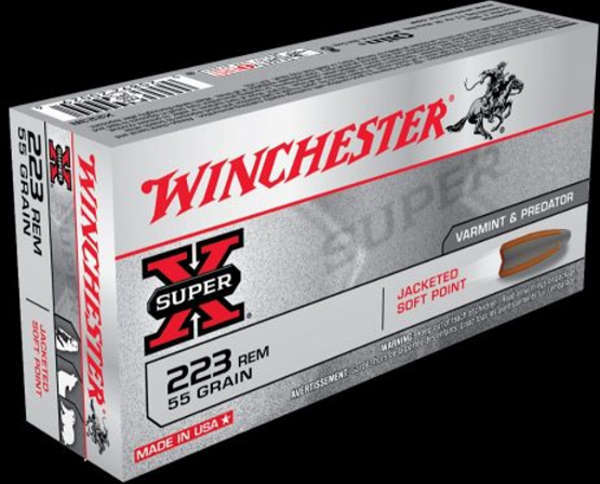 Winchester T22 40 Grain Target Shooting Ammunition a pkt of 50 rounds $5.00 , 500 Rounds $45.00 a case of 5000 will be $400. 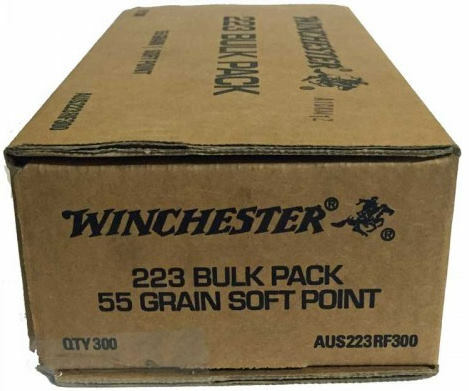 Winchester Primers, Large, & Small Rifle & Pistol, Shotshell, $49.95 per 1000 box, that works out at $4.99 pkt of 100, but you have to buy 1000 box to get that magic price. Until stocks last. 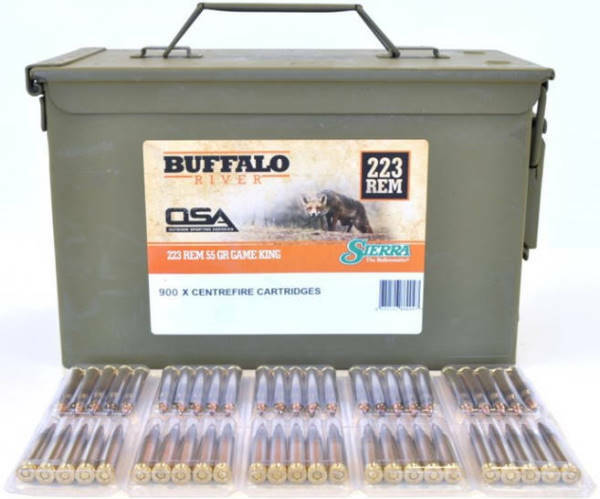 .223 Rem, .243 Win, .308 win, includes 3-9×40 Trophy Scope and Mounts, detachable magazines, synthetic stock. $695. J15 Puma, or AKA JW 15 Norinco, or AKA Chinese Brno. .22 five shot mag, dovetailed receiver for scope, open sites, black synthetic sporting stock. Twin opposing locking lugs, same as on the famous Model 2 Brno. Special Price until new stock arrives. $195. Wood stock models are $225. but we have back up stock and more than those in the photo. and lots more Tikka in stock and more on the way. WHY OWEN GUNS does not have SHOPPING BASKETS?? But has CONTACT MAIL ORDER Instead. 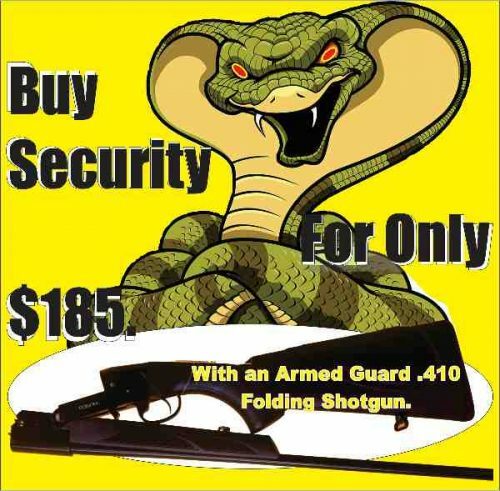 This Newsletter is published by Owen Guns 24 McMahon Road, Gympie Ph: 07 5482 5070. 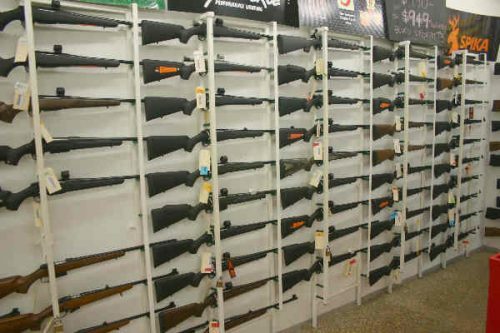 © 2019 Used Guns for Sale – Owen Guns, Gympie Queensland Australia. All Rights Reserved.